Photo from Life December 26, 1969, end of the decade issue. 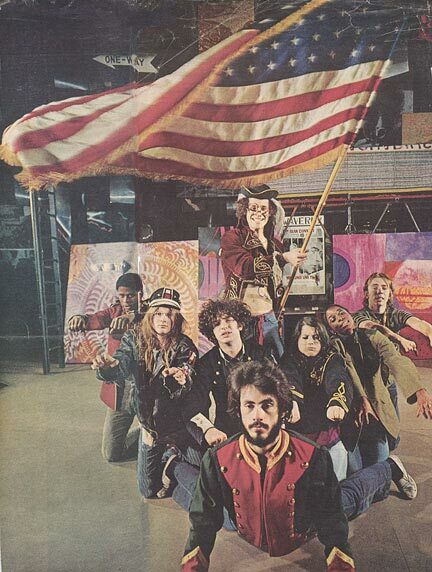 Caption reads: "In 1968 the hippies brought their message to Broadway in a freewheeling rock musical called Hair. Written and acted by non-professionals, Hair melted the heart of many a stalwart parent with its exuberance and gentleness, even as it spoofed such venerable American traditions as Washington's crossing the Delaware. Spreading throughout the country in multiple companies, and even abroad, Hair was a hit wherever it went." This photo is either of the Public Theater production or the Cheetah production, before Hair moved to Broadway.